The petal-packing perpetrator quickly fled the scene, but left his blossoming bait behind. New York (CNN) -- Police are looking for a smooth stickup artist who they say pulled off a bank heist last week wielding only a bouquet of fresh flowers. 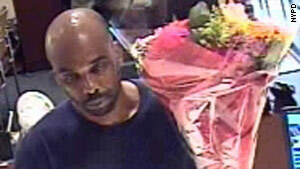 in New York's Chelsea neighborhood shortly before 9 a.m. Thursday, where he approached the teller and removed a demand note from inside bouquet, which was draped in pink tissue paper. "Give me all your $100s, 50's, don't be a hero," the budding bandit told the clerk. After the teller forked over the cash, the petal-packing perpetrator quickly fled the scene, but left his blossoming bait behind. The suspect, described as a male between the ages of 30 and 35, was not carrying any dangerous weapons, police said. The incident comes on the heels of a string of strange robberies in New York. Earlier this month, a man thought to be in his 60s or 70s tried to knock off an upscale clothing store while carrying a cane and wearing a nasal tube connected to an oxygen tank. And in June, a thief hit a Manhattan shoe store while donning a cat mask.